In England, home of the UK-based studio Aardman, The Pirates! Band of Misfits is hilariously named The Pirates! In an Adventure With Scientists, from the source material’s original title. The book by Gideon Defoe may not be squarely for children, but despites some off-hand historical references, this stop-motion animated adaptation certainly has youngsters in mind, complete with an ineffectual 3-D presentation. 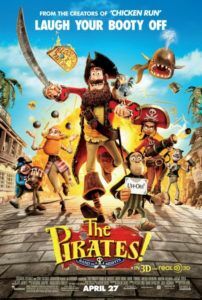 Sony Pictures distributes and advertises the film as a family-friendly romp for those who felt Pirates of the Caribbean was too intense for younger viewers. But the film itself may be too clever or “foreign” for youngsters unfamiliar with pointedly British sensibilities. Anglophile adults may have more fun soaking up these attributes and the associated witticisms throughout the film, which always manages to be merely just amusing as opposed to laugh-out-loud funny. Set in 1837, the story involves pirates, Queen Victoria, Charles Darwin, and a chimp named Mister Bobo. Our eccentric hero is known as “The Pirate Captain” (voiced by Hugh Grant). He leads a crew of second-rate buccaneers, prides himself on his jaunty beard, and fruitlessly dreams of winning a “Pirate of the Year” award from his fellow captains. Discouraged by more dashing and murderous seafarers in competition for this year’s award, Pirate Captain all but gives up his search for glory when he stumbles upon Darwin (voice of David Tennant), who informs the pirate crew that their resident parrot, Polly, is actually the last surviving Dodo bird. 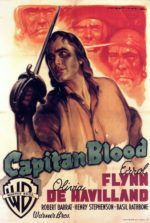 The Captain resolves to acquire fame and riches by presenting Polly at a science exhibition at the Royal Academy in London, for which he believes the top prize earn him a running in the “Pirate of the Year” competition. This decision enrages Dawin, who wants to reveal the Dodo discovery to the scientific community himself. Meanwhile, pirate-hater and glutton Queen Victoria (Imelda Staunton) wants Pirate Captain dead and the Dodo for an exotic meal. This story’s treatment, with its postmodern uses of modern slang and soundtrack (including The Clash’s “London Calling” and Flight of the Conchords’ “Not Crying”), seems more attuned to viewers of the post-Shrek variety. For audiences accustomed to Dreamworks fare, such out-of-place period flourishes will feel right at home. Everyone else may wonder why the Pirate Captain references “crew” in the “street sense… Yo” or why the Pirate King (voice of Brian Blessed) dresses like Elvis. Granted, nonsequiturs like these are just light, silly attempts at absurdity, as is the film’s frequent use of physical humor. But the story manages to be plenty funny in period appropriate, oft-inaccurate historical references. One scene finds Jane Austen (long after her death) and Joseph Merrick (roughly fifty years before his time) in the same pub, while a whole slew of quips at Darwin’s expense engage a headier sense of humor. Although most of the film employs the claymation technique, it’s evident how some scenes—especially those at sea—were augmented by CGI. 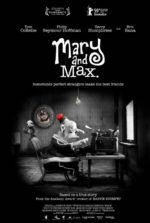 Aardman’s last full-fledged claymation film was Wallace & Gromit: The Curse of the Were-Rabbit back in 2005; after came Flushed Away (2006), a computer-animated film that adopted Aardman’s signature visual style; and then last year’s fully CG Arthur Christmas, which could have passes as a high-end Dreamworks title. Director Peter Lord (Chicken Run) nevertheless integrates the two modes so that claymation remains the prominent technique. 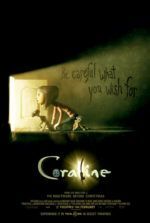 That said, typically the stop-motion style shines in a 3-D presentation (see Coraline), but here the weak post-conversion fails to enhance the film’s sculptural quality. A few sequences jut objects like a sword or googly eyes “at the viewer”; however, the effect doesn’t even give the film a relief-like quality and ultimately falls flat. Not as crowd-pleasing as Aardman’s earlier works, The Pirates! Band of Misfits is enjoyable enough to retain one’s interest during the brief 88-minute runtime, but not quite memorable enough to make a lasting impression. This is strange, considering the story’s fun-loving eccentricities. Shouldn’t a film with this combination of characters and oddball situations burn itself into the mind? Instead, the whole thing feels overly plain and, coming years after the height of pirate popularity when the Pirates of the Caribbean franchise was still in full steam, much too late. The talented voice cast (which also includes Brendan Gleeson, Salma Hayek, Jeremy Piven, Anton Yelchin, and Martin Freeman) lends much personality to the characters, with Grant surprisingly lively in his lead role. And Aardman’s animation, as always, is top-notch. Still, something’s missing here—an intangible quality to inspirit the proceedings. The mildly funny jokes seldom induce an audible laugh, even if they put a smile of soft admiration on the viewer’s face, while the plot mechanics work out in dull, predictable ways. Overall, this mild let down comes as a disappointing turn from the usually reliable studio.